ĐÀ NẴNG — Japanese runner Suzaki Yuuya won the men’s full marathon (42km), while Vietnamese Phạm Thị Hồng Lê finished first in the women’s division at the 2018 Manulife Đà Nẵng International Marathon – the sixth edition of the top marathon in Southeast Asia – in Đà Nẵng today. Suzaki, who won the Shonan International Marathon – one of the biggest races in Japan – clocked a time of two hours 32 minutes and 16 seconds. He beat his country-fellowman Koji Nishizawa, who came second with a time in two hours 45 minutes and 17 seconds, followed by Vietnamese Huỳnh Tấn Tiến in third with two hours 57 minutes and three seconds. “I was so impressed with local residents doing morning exercise along the Hàn River banks in very early morning. They (almost middle-aged persons) joined the team physical training, but not individual practice,” Suzaki said at the award ceremony after the race yesterday. “Sport training is seen very popular in Japan, but I felt very excited with Vietnamese people practicing in group in Đà Nẵng. That’s an unforgettable memory for me at the marathon and it made my race so perfect and joyful,” he said. In the women’s marathon, Lê finished first in 3hr 4min 4sec, faster than her teammate, Nguyễn Linh Chi, who came in second and France’s Marion Torres, who was third. Japanese runners dominated the other races as well, with Hiroki Nakajima winning the men’s half marathon (21km) in 1hr 24min 44sec. Vietnamese runners Nguyễn Đăng Khoa and Đoàn Hoàng Ngọc ranked second and third, respectively. 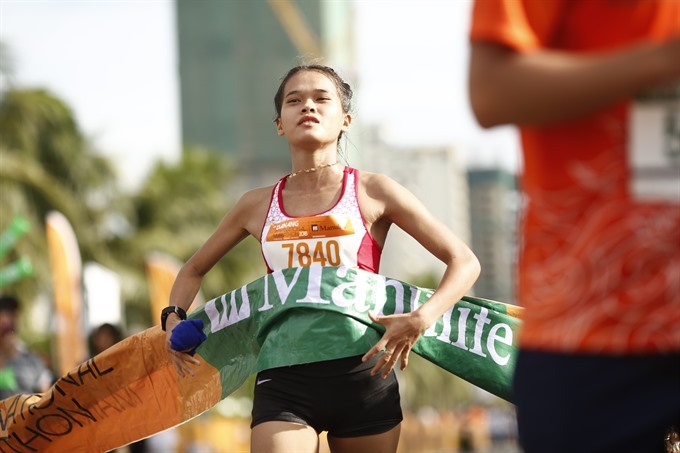 In the women’s 21km, Lò Thị Thanh from Việt Nam finished in 1hr 13min and 5sec to win the title, ahead of Japanese Tomomi Nakajima, who came second in 1hr 17min 40sec, and Nguyễn Thúy Phương in third. Vietnamese athletes – Lê Đức Tuấn and Nguyễn Thị Hương – won the men’s and women’s 10km. The race also saw more than 3,400 runners including wheelchair runners and disabled people racing in the 5km fun-run yesterday morning. 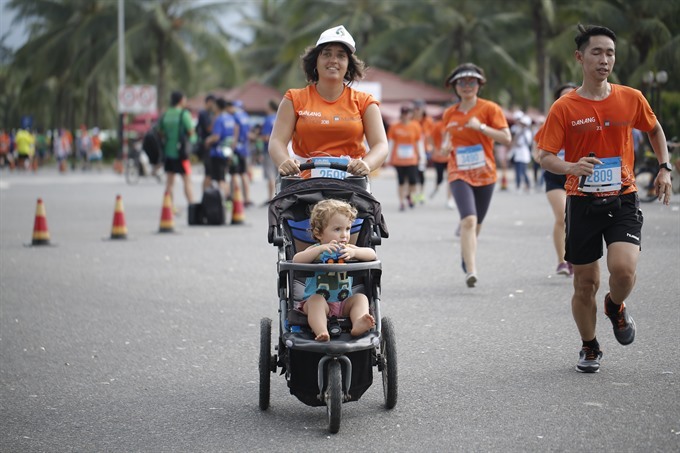 At least 215 children joined the pre-marathon 1km Ronny Dash Gong Cha on Saturday. The organisers, the World Marathon Company and Pulse Active, said the annual marathon attracted 7,200 local and foreign runners from 52 countries and territories, the most since it debuted in Đà Nẵng in 2013. This year’s race was an opportunity to promote Đà Nẵng to marathoners and millions of tourists visiting the city. 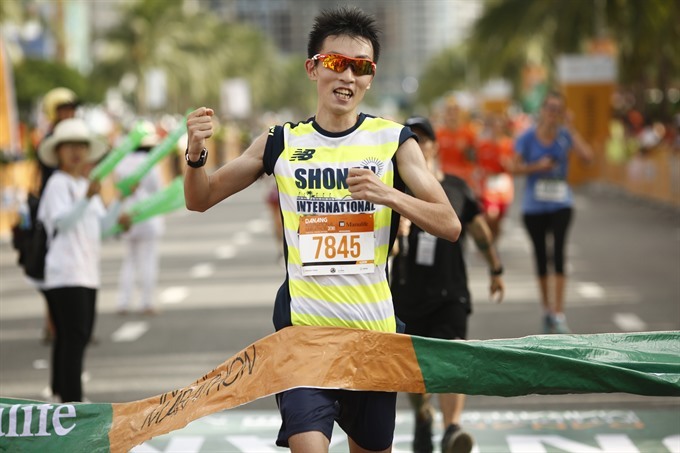 The two best Vietnamese marathoners (men’s and women’s divisions) will get free entries for the Shonan International Marathon on December 12 in Japan this year. Earlier donors raised more than US$11,600 to help the poor, the disabled and Agent Orange victims before the race. US veteran Dennis Zaborac and members of the Silver Strider Club from the US also took the race to promote a healthy lifestyle and to represent older runners and walkers. Last year, more than 5,700 athletes from 44 countries and territories joined the race, and more than $21,000 was raised for orphans, Agent Orange/dioxin victims, disabled people, the Village of Hope, and 15 low-income families in the city.